Our Art Deco vents by Classic Grilles are made with a black metal screen backing to allow air to flow into your room. These metal air grilles are hand crafted upon order and are sand cast in their mold to give you an original look. The Art Deco vents are truly a unique concept with a modern look to help cover up unsightly duct work. Our metal air grilles are made to be 1/4" thick, allowing them the durability of placing on your wall, ceiling, or floor. 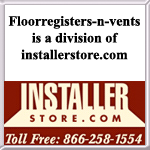 Please let us know if you are using this vent on the floor in the comments section. Unless otherwise specified the Art Deco vents are made with pre-drilled screw holes and come with screws. If you do not want screw holes, please note this during the checkout process. The white bronze metal air grilles are made in America and have a look similar to brushed nickel or chrome. These Art Deco vents may take some time since they are made to order and are considered a special order item. Call ahead to check stock on the size you need. These solid bronze metal air grilles will ship out to your home or office for just one low shipping cost. Tip: These metal air grilles need to be ordered according to your hole size opening in the wall or ceiling. An Art Deco vent measuring 8 x 8 will fit over a hole measuring 8 inches by 8 inches. Faceplate will be slightly larger by about 2 inches and more on the top with this design. Outer dimensions may vary due to hand cast style. Important: Art Deco metal air grilles may have to be manufactured upon order. Because of this, Art Deco vents will ship between 7 to 9 weeks after an order is placed. They are considered special order, non returnable items, and orders can not be cancelled once production has been initiated. Find other metal air grilles in other designs and finishes on our site which are also made by Classic Grilles. This Art Deco vent is also sold with a damper unit for those who wish to close off their air flow when not in use.